Here are a few of my favorite quilts. Click on the thumbnail to see a larger view. 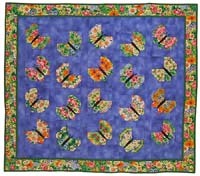 Visit my Workshop pages for many more quilt pictures! 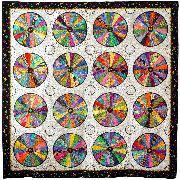 See how other quilters have used Stack-n-Whack® designs in innovative ways in the Show & Tell Gallery. This quilt is one of the first made with my new "Floral Magic" fabrics from FreeSpirit. Playing with the allover symmetrical print was a blast! This is a "Stack-n-Select" version of the design shown below. 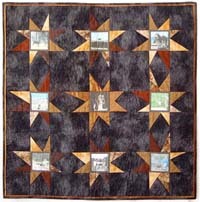 Here's one of the quilts in "Magic Quilts by the Slice" (AQS, May 2003). All the designs in this book are offered in both Stack-n-Whack® and scrap versions. Click here to see more projects from the book. This one was a great excuse to dig through my bags full of novelty prints! 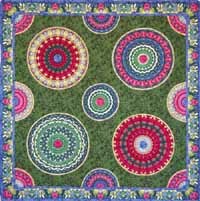 This is based on the Venetian Tiles design in Stack-n-Whackier Quilts (AQS, 2001). The main fabric is Bali from Paula Nadelsterns Symmetry collection for Benartex. This design from Stack-n-Whackier Quilts uses the Magic Mirror-Image Trick to produce the symmetrical patterns on the butterfly wings. The main fabric is from the Color Profusion line by P&B Fabrics. A horded stash of Cherrywood Fabrics hand-dyed cotton scraps inspired this quilt. The pattern is in Stars a la Carte (AQS, 2000). This was a Christmas present for my brother. It features photos of his basset, Emmett, printed on fabric treated with Bubble Jet Set 2000®. 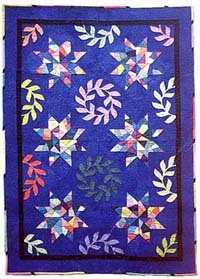 The pattern is an adaptation of one of Jan Mullens Starz designs.